The Southern Pacific built a fleet of 4-8-2 Mountain type locomotives in the late 1920s in its Sacramento Shops. In 1930, the SP designed a locomotive similar to those Mountains that had a very large firebox (90.4 sq ft) and a four wheel trailing truck to support it. Thus, evolved the Southern Pacific 4-8-4 which was designated Class GS (Golden State) by the SP. 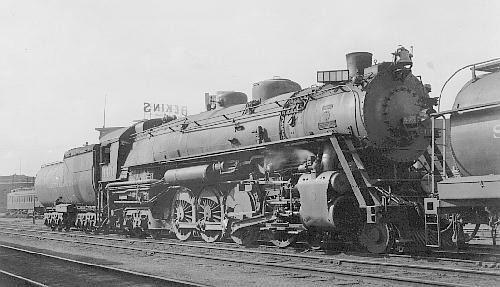 The first 10 "Golden States", Class GS-1 (road numbers 4400 through 4409), were built by the Baldwin Locomotive Works in 1930. They were oil burners with 73.5" drivers, 27 x 30 cylinders, and 250 psi boiler pressure, which resulted in a tractive effort of 62,200 lbs. They weighed 448,400 lbs and had 266,500 lbs of weight on the drivers. In early 1937, six more "Golden States" arrived but this time from the Lima Locomotive Works. These were designated Class GS-2 and assigned road numbers 4410 through 4415 and were identical to the Class GS-1s except for the exterior styling, color scheme plus they weighed 6000 lbs more. The color scheme used bright orange, red, black and silver. The orange was applied to the pilot and in a broad band along the skirting and the tender. The red was applied in a band above the skirting and above and below the orange band on the tender. The rest of the locomotive was black except for the smoke box door, which was silver, and the hand rails, which were cadmium plated. The six Class GS-2s were purchased for brand new trains that updated passenger service between Los Angeles and San Francisco. They sported a "Daylight" emblem and regularly hauled "The Coast Daylight". Late in 1937, 14 more "Golden States" (road numbers 4416 through 4429) were delivered from Lima. This group, Class GS-3 was similar in appearance to the GS-2s. However, they were designed for higher speeds with 80" drivers, 26 x 32 cylinders, and a boiler pressure of 280 psi giving them 62,800 lbs of tractive effort. They weighed 460,000 lbs and had 267,300 lbs over the drivers. The Southern Pacific ordered 28 more Class GS-4 "Golden States" from Lima and took delivery of twenty (road numbers 4430 through 4449) in April and May of 1941 and the other eight (road numbers 4450 through 4457) in March and May of 1942. These were similar to the GS-3s except they had "all-weather" vestibule cabs and had a smaller cylinder diameter (25.5) with a higher boiler pressure (300 psi). They weighed 475,000 lbs and with 275,700 lbs on the drivers had a tractive effort of 64,800 pounds. Two additional "Golden States" (road numbers 4458 and 4459), designated Class GS-5, were delivered from Lima in June of 1942 and were similar to the GS-4 except they had roller bearings on all axles and weighed 8,200 pounds more. During World War II, the SP like most railroads were in need of more motive power and it wanted more GS Class 4-8-4s, but the War Production Board would not permit SP to build more "GS" passenger locomotives. The Southern Pacific redefined "GS" to stand for "General Service" instead of "Golden State" and specified that this group would be used for freight as well as in passenger service. The board then approved the purchase. From then on "GS" officially meant "General Service". Due to wartime shortages, these last 10 Class GS-6 (road numbers 4460 through 4469) Locomotives were built without skirting and were void of the orange and red paint and were delivered from Lima in 1943. In 1976 4449 was one of three steam locomotives used in the American Freedom Train. There are two survivors: number 4449, which is operational, at the Oregon Rail Heritage Center in Portland, OR and number 4460 at the Museum of Transportation in St. Louis, MO. The Texas & Louisiana Lines, a subsidiary of the Southern Pacific, received the first Class GS-1 locomotives. These four "Golden States" were given road numbers 700 through 703. They had 73" drivers, 27 x 30 cylinders, a 250 psi boiler pressure, weighed 442,300 pounds and had a tractive effort of 62,200 pounds. Jul 27, 1958 SP GS-6 4460 deadheaded to San Fransisco then pulled the "Suntan Special" to Watsonville Jct. A diesel finished the trip to Santa Cruz over lighter rail. The above trip was repeated three weeks later. Oct 12, 1958 SP GS-6 4460, San Fransisco -> Fresno and return over the Dumbarton Bridge, through Niles Canyon, and down the west side of the San Joaquin Valley. Oct 18, 1958 SP GS-6 4460, excursion from Sacramento -> Donner Pass -> Reno. Oct 19, 1958 SP GS-6 4460, excursion from Reno -> Sacramento. Data from SP 7-1951 locomotive diagram book supplied in May 2005 by Allen Stanley from his extensive Rail Data Exchange. See also DeGolyer, Vol 82, pp.566+. Works numbers were 61390-61391 in May 1930 (T & NO), 61408-61415 in June (first 2 for T & NO), and 61430-61433 in July. First of the Golden State (or General Service) wheel arrangement. Four delivered to the Texas & Louisiana Lines. The design offered a relatively austere firebox layout with the only supplemental direct heating surface area provided by the 109 sq ft (10.1 sq m) in the combustion chamber. Boiler feed water was heated by a Worthington Type S, No. 5. Locobase notes that the Menke book shows 2,565 sq ft for the superheater of all of the early GS series of 4-8-4s. Each of these entries also has a page with a lower area -- 1,866 sq ft in this case -- and a revision date of 3/1/1950 or later. Locobase suspects that some of the superheater was blocked off in the late 1940s to lower maintenance costs. Data from SP Menke All Time Steam locomotive diagram book supplied in May 2005 by Allen Stanley from his extensive Rail Data Exchange. (Thanks to Chris Hohl for supplying the valve gear identification.) Works numbers were 7646-7651 in 1936. The oil-fired GS-2 is essentially a streamlined GS-1 and was the first of a series of streamliners that became steadily more colorful and powerful. The class had Worthington No 5-SA feedwater heaters. Locobase is puzzled by the Menke book, which shows 2,565 sq ft for the superheater of all of the early GS series of 4-8-4s. Each of them also has a page with a lower area -- 1,834 sq ft in this case -- and a revision date of 3/1/1950 or later. Locobase suspects that some of the superheater was blocked off in the late 1940s to lower maintenance costs. Data from SP 7-1951 locomotive diagram book supplied in May 2005 by Allen Stanley from his extensive Rail Data Exchange. (Thanks to Chris Hohl for supplying the valve gear identification.) Works numbers were 7721-7731 in 1937. As the Espee explored the implications of the power implied in the high-drivered 4-8-4 layout, they worked with Lima to recast the the GS-2 (Locobase 280). The result was a longer stroke balancing a smaller cylinder diameter; the piston speed of the longer stroke was ameliorated by a set of taller drivers. Boiler pressure rose 15% to more than compensate for the slight decrease in cylinder volume. The class also had 20" (508 mm) longer combustion chambers that added to direct heating surface area. Like the GS-2s, the -3s had Worthington No 5-SA feedwater heaters. These were part of the well-known series of 4-8-4s that pulled most Espee long-haul passenger service. Locobase is puzzled by the Menke book, which shows 2,565 sq ft for the superheater of all of the early GS series of 4-8-4s. Each of them also has a page with a lower area -- 1,834 sq ft (170.38 sq m) in this case -- and a revision date of 3/1/1950 or later. Locobase suspects that some of the superheater was blocked off in the late 1940s to lower maintenance costs. In a 1 November 2016 email to Wes Barris at steamlocomotive.com, Gunnar Henrioulle recalled his "last daytime view of GS-3 in action. [it]was notable. 3 consecutive (4420/4421/4422) trains working hard, about 12 hour apart, [each] with orange reefers Eastbound over the 29th & "B" Street overpass sometime in October 1956. " Data from tables in 1947 Locomotive Cyclopedia, supplemented by diagrams from several editions of Southern Pacific locomotive diagram books supplied in May 2005 by Allen Stanley from his extensive Rail Data Exchange. Works numbers were 7798-7804 in March 1941, 7805-7812 in April, 7813-7817 in May, 7848-7854 in March 1942, and 7855 in April. GS-4s were an enlargement of the basic SP 4-8-4 GS-3 (Locobase 1440) that had fewer small tubes and 22 more flues. Boiler pressure reached an even 300 psi and engine weight grew by 7 1/2 short tons (6.8 metric tons). The boiler had a Type 5 1/2 SA feed water heater. Superheater area varies considerably just among three entries in the two sources shown above. The 1947 Locomotive Cyclopedia listing reports the area given in the specifications in this entry. Within the Southern Pacific diagram listings, Locobase finds a GS-4 dated 31 July 1942 that agrees with the other heating surface areas, but gives 2,565 sq ft (238.3 sq m) for the superheater area. Another diagram that shows both the 1942 revision date and a later date of 1 March 1950 reports 1,834 sq ft. Similar areas at identical dates appear in all of the GS-1,-2, -3. and -4 diagrams. Could this difference reflect the removal of some superheater elements from some of the flues some time after 1942? The class was needed to handle the twelve-car Daylight over a hilly route between San Francisco and Los Angeles. Although they had 80-in drivers, the great bulk of the engine, especially with the air-smoothing casing, dwarfed the running gear. These huge engines had a broad orange valence over the wheels below a smaller red trim band that came halfway up the cab windows. They were oil-fired, used rapid-responding electro-pneumatic braking, and a trailing-truck booster that raised starting and hill-climbing tractive effort by 13,000 lb. Locobase notes that the the restored 4449 is credited with 1,834 sq ft (170.4 sq m) of superheating surface. Locobase suspects that some of the superheater was blocked off in the late 1940s to lower maintenance costs. Data from SP Menke All Time Steam locomotive diagram book supplied in May 2005 by Allen Stanley from his extensive Rail Data Exchange. Works numbers were 7856-7857 in June 1942. The two GS-5s were additions to the Southern Pacific's GS stud in 1942 and wore the same colorful livery as all of the rest. They differed from the previous locomotives in the smaller amount of superheat. The very useful PDF "RECORD OF STEAM LOCOMOTIVES PHOTOGRAPHED AS BUILT AT LIMA, OHIO" as compiled by the Allen County Historical Society notes that the first of the two engines was delivered with Timken Roller Bearings, the second with SKFs. Data from SP Menke All Time Steam locomotive diagram book supplied in May 2005 by Allen Stanley from his extensive Rail Data Exchange. Works numbers were 8013-8016 in July 1943 and 8248-8253 in August. These last ten engines in the GS series reverted to the GS-2/3 cylinder proportions and driving-wheel diameter for dual-service (freight and passenger) work. They were oil-fired (as were virtually all SP locomotives) and had neither streamlining nor color.